Walking Dead: Negan's Entrance Is Diffrent from the Comic, Is Glenn Safe? With Season 6 of The Walking Dead winding down, fans are both dreading and anticipating the season finale, because of how it ties into the original comic books upon which the show is based. Warning, their will be SPOILERS below. We know that the iconic Negan, played by Jeffrey Dean Morgan, will make his on-screen debut in the finale, after being teased throughout the back half of this season, but if his arrival is adapted directly from the comics, that means that fan-favorite character Glenn (Steven Yeun) may be killed off. Entertainment Weekly recently spoke with Steven Yeun, who was surprisingly upbeat about Negan's debut. "For me, his arrival is awesome. We've been waiting for this person for a long time, and in the comic books, he in a way brings a level of stakes that are kind of unmatched. And so, for me, for Negan to come into the show is, to say nothing less, f-ing awesome." In Robert Kirkman's comics, Negan makes his debut in the 100th issue, where he takes Rick and the Alexandrians by surprise, before choosing one person at random to kill, Glenn, smashing his head in with a baseball bat wrapped in barbed wire he calls Lucille. Then again, the show hasn't always followed the comics to a T. In the comics, Shane (Jon Bernthal) dies in just the sixth issue, but the character wasn't killed in the show until the end of the second season. During The Governor's (David Morrissey) raid on the prison in the comics, it's Tyreese (Chad Coleman) who gets killed by this villain, but in the show, The Governor kills Herschel (Scott Wilson). While he wouldn't go into specifics, Steven Yeun teased that Negan's introduction may not go down the same way in the show. "I know people are going to always go, 'Negan kills Glenn in the comics,' but rest assured that we don't necessarily do what's in the comics. There's a clear divide in the way we tell a story on television, and the way that story is told in the comics, because it has to be. And everybody will have to see what happens, but we definitely tell our story in the way that television should be told. That's the beauty of the adaptation. There is something to be said about something being predictable. I'm sure there are iconic moments, but at the same time, we want to keep this show as fresh and alive as possible, and we're going to tell that story that exists for the world we've created. And it is inspired by the world Robert Kirkman has created, but it's also its own entity, to some degree. So, yeah. I mean, we'll see what happens." 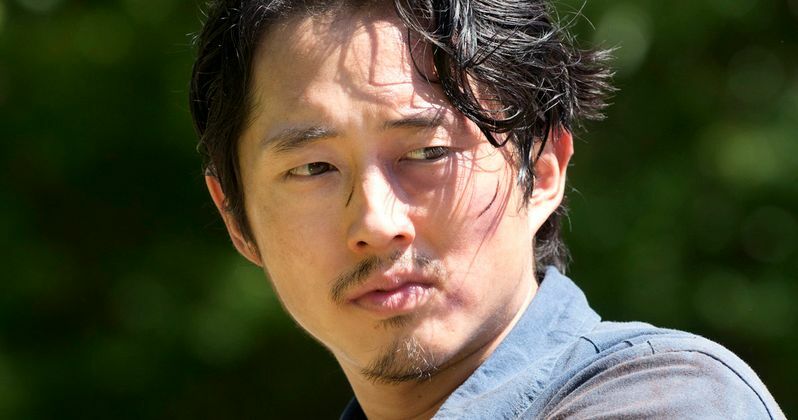 While Glenn may live to see another day by the end of this season, there have already been plenty of indicators that The Walking Dead season finale will be dark and shocking. Melissa Suzanne McBride said that she felt like she had "dropped into a blackhole" after reading the finale script, and the plot synopses for the final three episodes hint that there may be at least two pivotal deaths, where Negan, "teaches Rick and company a brutal lesson", showing they "finally have something to fear." While he wouldn't go into specifics, Steven Yeun had this to say about the finale. "I mean, we go for it. The thing that I can be most proud about on this show is that year after year we just continue to go for it. Whether we fail or whether we succeed, we just go for it. And things are tough. The conditions are tough. I would love for someone to come out and check out what a day of filming can be like. I could show you pictures that I took where you can see my entire leg all up the side completely covered in disgusting bruises. And that's not just me. That's everyone. Everyone has something happen every year. Yes, it's brutal what happens story-wise with all the things that we try to tell near the end. But it's also what we've always been going for." Next week's episode, Twice as Far follows Heath (Corey Antonio Hawkins) and Tara (Alanna Masterson) as they go on a supply run but "find trouble." The March 27 episode, The Calm Before, could feature a pivotal death as well. The synopsis teases that Rick confronts a "horrible situation," and the finale plot rundown teases that it's set in the aftermath of a tragic blow. In the comics, just before Negan's arrival, Abraham (Michael Cudlitz) was killed by the Saviors, and Eugene (Josh McDermitt) is captured by this nefarious group. What do you think will happen when Negan finally arrives on The Walking Dead?